Coconut cream powder from Thailand's finest producer--Chao Thai brand. Packed in a high quality sealed foil packet and sold in an attractive box. This is an instant coconut milk, popular for so many of our regular customers--even backpackers seeking high calories in powdered form that just need water. To make an excellent, creamy, fragrant coconut milk is very simple. Mix one 2 oz packet of coconut cream powder, with 1 cup warm water. Mix well. This makes exactly 1 cup of rich coconut milk. One 2 oz packet yields about 1 1/3 cups of coconut milk. Looking for a few good recipes: try green chicken curry, coconut cornflake cookies, and coconut ice cream. Also see our recipe below for our original Thai ice cream. This product is hygienically prepared from fresh coconut. It's a quick, easy way to cook. Just add warm water and you'll get rich cream that's ideal for curries, desserts, cocktails, confectionery, fillings for waffles, doughnuts, puddings and yogurt. We visited the factory in 2007 and found the overall operation to be quite impressive (see story below). Aside from coconut cream powder, they pack various products in international brands, such as nondairy creamer and hot chocolate mix, using coconut cream powder as the base. This coconut cream powder is a great substitute for milk in coffee. Ingredients: Fresh coconut cream 85.2%, glucose syrup 11.8%, sodium caseinate 2%, silicon dioxide 0.5%, dipotassium phosphate 0.5%, no preservatives. We also offer a good quality coconut milk. This is an easy Thai dessert with universal appeal. More about Coconut Cream Powder. Making coconut cream powder starts with mature coconut, the kind with brown outer color (as opposed to young coconut which is green). Mature coconut is harvested year-round in Thailand, although the harvest slows three months during the year. Provinces producing the best coconut are Chumpon, Sri Thammarat, and Prachuab Kiri-Khan. The tree should be at least 5 years old. The peak productivity for a coconut tree is between the ages of 25-50 years old. 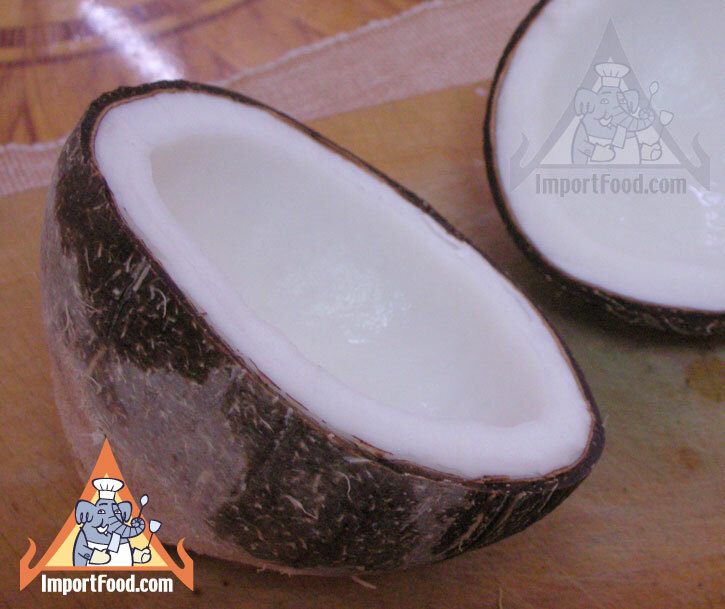 At that time the trees produce the best quality coconut (meat with high fat). After the tree is 50 years old, productivity declines, and after 70 years old the tree will produce no useable fruit. Each coconut used to make Chao Thai is 1 year old. First the hard outer skin is removed, then a machine crushes the coconut with great force in order to get the cream out. From this stage, a bit of water is added to the mix, glucose, and a small amount of sodium caseinate is added in order to assist the coconut cream to emulsify with the water. Other processing aides provide anti-caking of the coconut cream. The coconut mix is then heated to just above 150 degrees celcius and sterilized via pasteurization. The warm mixture is then sprayed into a large stainless tank which promptly turns the mixture into a dry powder with less than 2% liquid content. Using modern, state-of-the-art packaging equipment, this powder is then packed into very high quality sealed foil packages and sold to ImportFood.com for your enjoyment. The same manufacturer of our coconut milk uses the product to produce non-dairy creamer and other beverage mixes for several very famous international companies. We have visited the facility in person and are very happy with the overall operation, and note the sophisticated laboratory they have for research and development. Coconut cream powder can be added to coffee, along with a bit of sugar, as a delicious non-dairy creamer. It is also a great source of natural fat used by some in the bodybuilding world. Backpackers have reported widely on the success of this product also, as it is lightweight and with a bit of water you have instant coconut milk to use in the preparation of gourmet campsite meals. 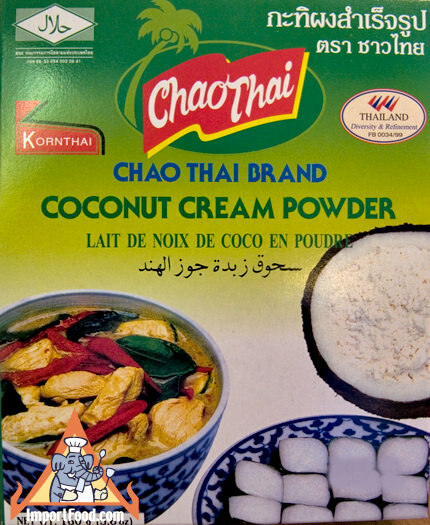 Customer Testimonial: "My Chao Thai coconut cream powder arrived in plenty of time (as advertised) for me to get my food ready for my backpacking trip. This powder tastes amazing in hot or cold breakfast cereals, moose goo, coffee, hot chocolate and many lightweight dinners. I wouldn't backpack without it and highly recommend ordering from ImportFood Thai Supermarket. I'm a very happy customer!"